A picture tells a thousand words. If you notice the region between the arm and the wound, you will see that it is fluid filled and very inflamed, causing a great deal of pain and discomfort. 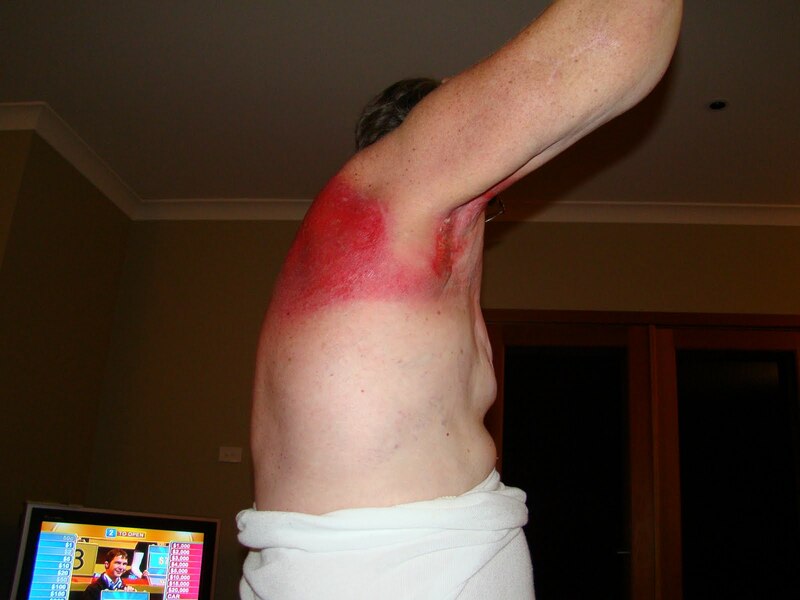 There is a concern that with little movement of fluid, cellulitis is a potential risk. I have decided to do a review of test results and findings. This will provide an overview of the disease, and its progression, allowing me to summarise at a later time. Fact: When Haydn and I retired in July 2008 there were plans to farm, socialise and travel; and not necessarily in that order. Fact: Although Haydn had owned the land for approximately 20 years, the new house was built with a view to living comfortably in retirement. All of these things take money; we thought we were prepared for all possible outcomes. Fact: It was only a matter of weeks before I began suffering debilitating pain; pain that had me watching television from the couch throughout the night while walking down the driveway screaming in agony during the day. Pain that prevented me from attending local Tai Chi and yoga classes as a way of exercising and meeting people. Fact: It April 2009 that I was eventually referred to a Consultant Neurologist who recognised my suffering and requested a MRI. I was prescribed Oxycontin and Lyrica [pregabalin] for the pain. Conclusion: Appearances consistent with amorphous metastatic infiltration of the right thoracic outlet involving muscles, brachial plexus and vascular encasement with axillary lymphadenopathy. Fact: Radiotherapy was the only treatment offered. At no time was I told of the potential for secondary cancer as a result of treatment. Due to the severity of my pain, I failed to do my own research. I was told that the recommended dose would minimise the risks and maximise the benefits given that the area could not be re-radiated. I accepted that it was to be done in 'good faith,' therefore I chose to place my trust with the doctor. This picture was taken well before the end of treatment as Haydn refused to take pictures as my flesh began to burn like a blowfly on a barbecue. Fact: Approximately 5 days before last scheduled treatment I went in as usual and prepared myself to be 'zapped.' It was then I was told by the lovely Mel to put my clothes on again. She proceeded to hold my hand as she took me with her to the Nurses' Station where she abused them for allowing me to go home the previous day without receiving, what she called 'appropriate' treatment for the burns. More importantly, she asked why my Radiation Oncologist had not been notified of the damage. There were sparks flying. In hindsight, maybe the 'good' doctor could have reviewed the situation. Conclusion: I think it is obvious. Fact: In May 2009 my Radiation Oncologist referred me for a CT of Neck, Chest, Abdomen and Pelvis. Conclusion: Tumour recurrence at about the level of the surgical site extending through into the root of the neck. Malignant lymph nodes in the right axilla. Oncologist made no recommendations. It now appears this may have been the beginning of the secondary soft tissue cancer, resulting from radiation damage. Fact: In January 2010 a CT of the Neck and Chest resulted in evidence of a new soft tissue lesion which arrived anterior to the right first costosternal joint. Lesion measures 15 x 17mm. Commenced Arimidex [Aromatase Inhibitor] At this time the increasing nerve pain in my right arm/hand had effected my ability to function normally in the home. Domestic duties, previously undertaken so easily, had now become difficult. Much of the fun of cooking was gone. I was also thinking seriously about life on the farm. No longer able to drive a motor vehicle due to prescribed medication and disability, I began to feel 'trapped.' It was my blog 'buddies,' Memory-of and Facebook friends that allowed me to have the friendships lacking in real life. Fatigue was an issue as talking on the telephone wore me out. I felt deserted by friends that found the 180km 'round trip' from Newcastle just too far to travel. Once again, we were disadvantaged by the isolation. Fact: In February 2010 a PET Scan noted several foci of increased FDG uptake within the upper arm/chest, including 3-4 lymph nodes. A large right jugular node was also noted. Increased uptake noted in several nodes throughout the right chest wall. Conclusion: There are several right upper arm and chest lymph nodes, including a contralateral left tracheobronchial lymph node, which are consistent with malignant disease. The Referring Physician was the same Radiation Oncologist who, at no time, recommended further treatment. Fact: In April 2010 a Right Arm Venous Doppler showed a chephalic vein thrombosed over a 9cm segment. Fact: Comparison PET Scan - by now radiation damage from treatment and testing puts me at increased risk. Conclusion: Comparison with February 2010 PET-CT scan demonstrates significant reduction in intensity of activity in the persisting nodes in the right axilla, right neck and right parasternal Aromatase Inhibitors. Fact: In January 2011 'Dr Amazing' requested a Radionuclide Bone Scan. Conclusion: No evidence of boney metastases. Conclusion: Increasing size of right supraclavicular lobular masses with associated bone destruction. Suspicious change in the area of right inferior lung scarring which may reflect further benign change or small mass. Post surgery right axillary changes mostly due to radiotherapy with also a suspicious nodal metastasis which has not enlarged. Fact: In May 2011 Neck CT shows previously noted left supra-clavicular adenopathy with a solitary nodule measuring approximately 6mm remains relatively unchanged. The right medial clavicular mass has enlarged and now measures approximately 4.3cm x 19.5cm in transverse and AP dimensions. Again underlying permeative bone destruction of the medial clavicle and its cortical margin is noted. CT Chest - same date compare to January study. There is an ill-defined soft tissue stranding in the axilla which was previously noted and is unchanged. A nodule in the right pectoralis is likely secondary to post radiation effects. Conclusion: The right supra-clavicular lobular mass with associated bone destruction has increased since the previous scan. Fact: In June 2011 Dr Amazing requested a PET scan which showed an avid FDG uptake in the right chest wall lesion which now measures 67.6mm height, 53.5mm at greatest width and 20.7mm. There is a periosteal invasion with FDG uptake in the right medial clavicle. Immediately lateral to this lesion there is a small FDG avid nodule in probably a subpectoral site. There are at least three further lesions in the anterior chest wall from the nodule to immediately anterior to the liver. Oh my God, Cheryl, they call them practitioners for a reason! Each doctor wants to inflict their own expertice on you. My fater went through the same proceedures. A surgeon first who cut like a mad butcher and then the radiologist with his Star Wars zapping machine and finally the chemical guru and his mix of left over WWI mustard gas! He did from the cure. You are so much braver than I. I would have gone to the licquer store and sought my healing there long ago! I am so very sorry for the suffering you are going through. Oh Chez oh Chez oh Chez. Sending you love, hugs, and very big sighs from the other side of the world. Chez you shouldn't be going thru this,if they have give you the info in the first place and checked on you after the deep burn then would of stop it before.Chez you have had to goggle so much to save your life,and you should of been able to trust the ones that was taking care of you and believe in there knowledge. Will talk to you on this as my writing is not coming out the way i would like. Big gentle hugs always my friend. I'm lost really for what to say except I think of you daily and feel deep anger at what you've had to experience. How I wish I could take this all away! And how can one deal with this? I will pore over the details carefully. Certainly there is some clinical trial for this..
Ah, Cheryl, your post is brutally frank. I am so very sorry...wish I were next door and could just drop in for a hug and perhaps a cry or two. I continue to keep you in my prayers. Sue, it is interesting to note that each time I think I have come up with something (often with help from you) in the way of treatment, there seems to be a barrier. Although I do not have expectations, for fear of disappointment, I pray for relief from the pain. Keep the faith, and we are all praying for a miracle to happen. Chez, Seeing these facts makes me feel a lot of things. I'm sad for all you'be been through and continue to go through. I'm inspired by you. I'm angry when I see those burns. I appreciate your visits to my blog even more. Mostly, I want to send you gentle hugs. Know that you are always in my prayers. You have been through so much, but yet you continue to be a beacon for others. Your courage and strength speaks loudly through your words.